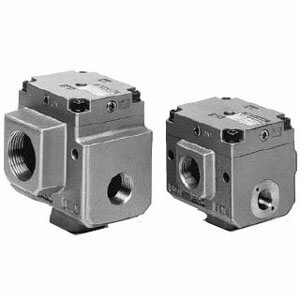 SMC's 3 port air operated valve, VPA300/500/700 is available in body ported or base mounted styles. The VPA offers a high flow capacity of Cv1.0 (VPA300), Cv2.3 (VPA500), Cv4.0 (VPA700). It is possible to use the series as either a selector valve, or divider valve. The VPA is changeable from a normally closed style to a normally open style.